James Ensor, Confrontation (La critique sur mon oeuvre), oil painting on canvas, 54 x 65 cm, signed below middle, not dated, Bart Versluys collection. Ensor and his oeuvre were the essence of his artistry. This culminates from the 1930's in an unabashed ode to himself, his art and his ideals. There are examples aplenty: L'atelier de James Ensor (1930, Tr. 602), Nature Morte au chou rouge et à l'assiette (1930, Tr. 603), Nature Morte avec autoportrait au chapeau fleuri (ca. 1930, Tr. 604), Fleurs, fruits et masques (1931, Tr. 612), Ensor à l'harmonium (1932, Tr. 620), Ensor et les masques (1935, Tr. 655) (image 1). (2) Confrontation holds a special place within Ensor's oeuvre due to an exceptional and complex strategy of images. In place of one-sided complacency, Ensor depicts a detailed, worked-out confrontation in which he shows his never-ceasing efforts for recognition. In 2015, an unknown painting, signed ‘Ensor' appears. It is not mentioned in the catalogue of his works of the paintings (X. Tricot, 2009), yet style, lines, colours, texture and the narrative character are undoubtedly Ensoresque. The only available historical source is a photo certificate from Galerie Georges Giroux from 1953 with the mention on it reading: La Critique sur mon oeuvre. The painting is divided up compositionally and content-wise by a central column formed by a grieving angel that bears a donkey on her head. This is the vertical axis along which two scenes play off each other with a continuous parallel build-up. On the foreground is a mass of people, masks and animals. 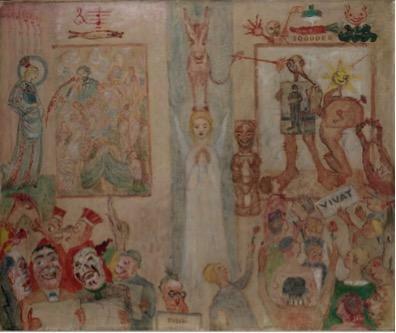 On the middle plane are works and citations from the earlier oeuvre of Ensor. On the upper plane are the most diverse attributes such as vegetables, a herring, a musical notation and numbers. The donkey and the angel form the core of the confrontation. The angel, alias Dame Peinture, along with the left panel stand diametrically over the donkey, Maître Aliboron, the ethnic sculpture and the right-hand side. Ensor places the pure beauty and the unspoiled inspiration in contrast to, according to his opinion, the commercialised formula and the primitive ugliness. This Dame Peinture is the counterpart to the Madonna that he paints on the left. Ensor combines two paintings in an ingenious way: La Vierge Consolatrice from 1892 (Tr. 354) (image 3) and Mes Houris from 1927 (Tr. 586)(image 4). He copies the figure from the Vierge Consolatrice to which he looked up to then and before which he humbly kneeled. (9) In Confrontation she playfully moves with her lily stem the portrait of Ensor that is integrated within an adapted copy of Mes Houris. Now, Ensor is not the solitary devotee of La Vierge any more, he even becomes adored by an entourage of women. The iconography of Mes Houris is inspired by a Koran verse in which the departed is received in Paradise by youthful virgins with dark eyes called ‘houris'. (10) A noticeable detail is that Ensor depicts himself here as a 30- year old- the same age as in the work La Vierge Consolatrice- while in the original work of 1927 he appears as a white-haired and bearded 67-year old. He paints a mix of old and new work, an exchange of early and late self-portraits. With this reinterpretation of both works, he lets it be seen that the woman is a constant in his oeuvre, already from his younger years and always still. La Vierge Consolatrice, Dame Peinture and the virgins from Mes Houris are sublimated archetypes of ‘the woman' in Ensor's universe. They represent the true beauty and bring him inspiration and comfort. At the top of the scene, he paints a sort of rebus by which he uses attributes as a reference to his talents: a herring, the G clef and two music notes on a music scale. He has chosen the herring as a symbol of his art; ‘hareng saur', a sort of phonetic visual wordplay for ‘Art Ensor'. (11) The music notes refer to the harmony of the musical pieces that he composes. They emphasise that this work deals with more than painting alone. The message of Confrontation has a relation to his total artistry, inclusive of his vision and points of view. At bottom left we see a carnival group of judges, masquerades, and animal (masks?). The colourful group walks along singing, squabbling and laughing at us. Four personages are engrossed in a musical or textual sheet. The left-hand portion shows a few important themes from out his oeuvre: Beauty, the woman, crowds, song, pageants and masks. (12) The goat that comes out of the canvas on the left is the counterpart to the donkey on the other side. The goat, the symbol for the festive and Dionysian, stands here in contrast to the stupidity and stubbornness of the donkey. The physical likeness of the man with the glasses that stands bottom centre and is reading the paper on which Ensor has put his signature is strikingly like René Lyr (images 6-7). This was one of the originators of the naming of Ensor as Prince des Peintres et des Arts in 1934, to which the small crown could be indicating a noble attribute. In contrast to Ensor's joie de vivre and ‘profession for Beauty', the right-hand side of the canvas appears to be an inventive critique. Ensor ties a brush to the tail of the donkey and allows him to make a painting: a monstrous figure on a podium that shows a work by Ensor (Le Lampiste) next to a barrel organ. This personage and his ‘quality' were masterly manipulated by Roland Dorgelès, a young journalist and writer from Paris. In 1910 at the Salon des Indépendants in Paris, he exhibited under the pseudonym Joachim-Raphaël Boronali. (15) To his delight and surprise, his painting Et le soleil s'endormit sur l'Adriatique garnered favour and was sold for the sum of 400 francs. (16) Afterwards, Dorgelès came out with the controversial revelation that this work was painted by a donkey (image 8). He had photos taken of the creative process and had everything ascertained by a bailiff. (17) Moreover, the name Boronali was a hint, namely the anagram of Aliboron. Dorgelès-Boronali likewise published a Manifesto of Excessivism in which the new trends of art such as Cubism, Futurism and Expressionism were ironically encouraged to exaggerate even more. This sensation from the cultural world of 1910 was described extensively by the press, and Maître Aliboron became a concept. By the choice of the painting donkey as the central icon, Ensor aligned himself with the vision that the pure beauty and pure inspiration were exchanged for ideas and formulas by these vulgar ‘isms'. Image 9: Detail from a décor from Ensor’s ballet, La Gamme d’Amour (first tableau, le magasin de Grognelet, 1912). Above right the gesture ‘un pied de nez’ is depicted. Image 10: Photo of a foot organ, the foot serving merely as support for the barrel organ. Image 11: James Ensor, Detail from: Confrontation, 1934-35, oil on canvas, 54 x 65 cm. Ensor repeats this sharp viewpoint in an interview: Ah ce qu'on en a fait de la cochonnaille depuis trente ans! J'espère vivre assez vieux pour assister à la suprême crevaison de ceux qui ont cherché à fossoyer la lumière, les formes et la beauté. (34) He seems to want to make use of the historical context in order to put himself and his earlier oeuvre in the spotlight again. He strikes out first at-in his eyes-a failed generation of young artists; then he moves on, just as he treads on the path of light and beauty. In 2015, this painting was subjugated to an extensive, documented material-technical study. (35) The x-rays, ultraviolent recordings and infrared reflectography tell a lot about the creative process. The right side with a monster, a barrel organ and an early work by Ensor (Le Lampiste) was an ensemble difficult to determine. We notice from the technical analysis that the overpaintings and changes were the most numerous on this spot of the canvas. Thus, from the radioscopy it appears that the monster was originally a personage with a hat on, possibly the ‘lamplighter boy' himself (image 12). (36) Ensor later painted over this to the present-day painting. Image 13: James Ensor, Le Lampiste, 1910, oil on canvas, 99 x 58,5 cm. The many brush strokes in the underdrawing are rather hazy, unstructured and of course are worth noting. The underdrawing, down in blue pencil or chalk is often not followed, and in the right side the many blue erasures-conscious or unconsciously-are still visible through the paint. The fact that he also made additions on top of the layer of paint indicates that the work was subject to changes to the last minute.This is not a definitive hand but a searching process for the optimal depiction of a specific feeling via well-intended motives. The various styles that he uses in the left and right panels also contribute to the content's meaning. La Vierge Consolatrice is wonderfully stylised and decorated in detail rendered in a Neo-Gothic, symbolist idiom, while the right panel, ‘the work of the donkey' is consciously rougher and superficially executed. This seems like an Ensoresque interpretation of form of Modernism. Still a few significant changes are brought to light: in the lower-right corner, the two heads were originally a kissing couple (image 14), a motif that frequently shows up in his oeuvre (image 15). The head of the men who throws his arms in the air was originally depicted frontally, with a visible face. Image 14: Detail from the Infrared composition (lower right) from the treatment report B. Brakebusch (16/06/2016) as opposed to painted-over end result. Image 15: James Ensor, Detail from: The baths of Ostend, 1890, black chalk, coloured pencil and oil on wood, 37,5 x 45,5 cm. During the 1930's there is a polemic in the art world between innovating and stabilising. Ensor, 75 years old in the meantime, shares the idea of a Retour à l'humain and uses his status to defend this message with verve. He couples his rather conservative bent towards beauty in painting, architecture, literature and music with the social debate. Between 1925 and 1935 he experiences a period of rising recognition. In 1929 he receives a large retrospective in the new Palace of Fine Arts in Brussels and receives the title of Baron. Later he is proclaimed the Prince de la Peinture et de l'Art by his fellow artists and for his 75th birthday, in 1935, manyfestivities are organised, as well as the unveiling of a portrait bust. And yet he felt the compulsion to paint Confrontation. It is a painting with a layered content. It is a manifest, nearly a pamphlet, in which he defends his vision of classical beauty at the expense of the contemporary movements. The chosen images adhere to his theoretical reflections. Numerous introductions and essays overlap with this painting. He paints his vision in a polarising manner, hence the title Confrontation: the lily leaf of La Vierge Consolatrice brings inspiration, the brush of Maître Aliboron deception. Finally, this painting shows how Ensor applies all means in order to defend his rather unnuanced and categorical standpoint. Previously he used caricature, irony and masks as biting commentary on society. Now, laureled and praised, he uses the same means as biting commentary to the new art movements. Also in his speeches and letters he plays with rhetorical exagerations and this frequently for increasing honour and glory for himself. This painting is an illustration of his manipulative capacities. He is convinced of it and feels himself compelled as well to show that he is the forerunner of many modern ‘isms'. By depicting early works he repositions himself in the history of art, he prolongs his place of honour and tolerates no doubts. This is the how and the why that he feeds his myth. (2) This listing is not exhaustive. (3) In a forthcoming feature, I call up to entertain my readers with a recent canvas by James Ensor entitled, ‘Confrontation'. A canvas with an irresistible humour, without falling into vulgarity, and at the same time a sharp, painterly presentation. (5) Ugliness in all its forms means for him a torment since the beginning-physical ugliness, moral ugliness, intellectual ugliness-and one can recognise nothing other than a staunch protest in his biting painted and engraved satires, and then an expression of his sarcastic rancour against those who befoul life and art. Recently still Ensor, who shall never change, avenges Beauty, too often mocked the last 15 years, in a mischievous canvas that he calls ‘Confrontation'. We see on the right side a Baroque personage with enormous feet and Ensor's ‘Le Lampiste' in his hands (from which the feet and the curtain are claimed by a certain school, because of their, as we might say, Surrealist appearance). Above him, an absurd garland of turnips, sprouts and carrots and under him ‘Prudhommesque' figures that crown a triumphant personage. For this painting of sacrilege Dame Peinture, in the middle, closes her eyes and weeps, while above her, foolish and dominant Maître Aliboron, with a knot at the end of his tail serving as a paintbrush, unknowingly, lightning-fast produces masterpieces. (This enormous farce was carried out before the War by a few rascals in Montmartre). On the left side we see the mourning virgin who points a nostalgic palm branch towards the portrait of Ensor, ring by soft, rose figures and flanked by his attributes: a sour herring, a treble clef and pleasant masks. (S, 27/03/1935). (6) Against the whole world in the name of beauty, in the name of goodness, against the Devil and his train, against engineers, architects, ministers great or small. (J. Ensor, 1934 in Ensor 1974:188). (9) That Ensor gives the figure of La Vierge Consolatrice a prominent place within Confrontation is not by chance. On 4/11/1934 he writes an article ‘Sur les vierges consolatrices' in honour of the exhibition ‘Les maîtres de la femme' in Le Studio at Ostend. He says about this work: Je la garde jalousement, elle est le mienne et je l'aime. (10) Koran, sura 56 verses 12-40; sura 55 verses 54-56; sura 76 verses 12-22. (11) The motif of the herring-‘hareng saur'-is also used in La Vierge consolatrice (1892). (12) We recognise various motifs from earlier works, amongst which ‘singing masks' (i.e. Les Chanteurs grotesques; (1891, Tr.336) and Ensor et les Masques (1935, Tr. 655)) and judges (Les bons juges; 1891). The reptile and the singing masks were nearly identically recalled in Ensor et les masques (1935) (see image 1), a work that was painted in the same period as Confrontation. (13) The nickname ‘Maître Aliboron' begins in the 14th Century and is popularised by the fable of La Fontaine ‘The donkey and the robbers' (Fables I, 13). (15) GROJNOWSKI D. (1991), p. 41. (16) GROJNOWSKI D. (1991), p. 46. (17) The report of the bailiff was published in the paper Fantasio from 1/04/1910 and L'illustration from 2/04/1910. (18) Ensor knew this instrument well, one of the pieces of his ballet La Gamme d'Amour is called‘orgue de barbarie' or barrel organ. (19) Ensor mentions this expression many times in interviews and essays. (20) FLORIZOONE P. (1998), p. 75. (21) He uses the expression ‘standing of feet of clay' in the essay ‘discours adressé aux conferères masques': bâtisseurs enchevêtreés aux pieds d'argile (...) (J. Ensor, 1974:180) and in the essay Sur la crise de la peinture: Architectes aux pieds d'argile votre règne touché à la fin (J. Ensor, 1974, p. 160). (22) Ensor probably depicts a Songye image in the Belande style here. These are recognisable by the large, laughing mouth. (24) A consolation! Indeed, the Cubist mention the angles of Le Lampiste (1888) and the lines of Le Liseur (1881) as important precedents, variations of beauty (...) (J. Ensor, 1911 in Ensor 1974:13-20). (25) In Confrontation it is the second version of Le Lampiste that he copies. The blue colour and form of the glass from the lamp confirms that, and the format of the second version is ‘more tolerable'. Yet, he has here also added the date '80, which only exists on the first version. (26) During his career, Ensor continued to relativise Modernism and at the same time cultivates his role as pioneer with necessary irony. In 1925 he says about his early works: Quand je refeuillette mes cartons de 1877, je retrouve des angles cubists, des éclats futurists, des flocons impressionists, des chevaliers dada, des attaches constructives [sic]. (J. Ensor, 1925 in Ensor 1974:95). (28) Here he shares the opinion of traditionalists such as art critic Camille Mauclair viewd the L'Industrie du tableau as one of the causes for the fall of L'Art Vivant. I only fight le faux nouveau', the false originality and the absurd. And I reverse to the fake artists launched by a consortium of merchands and brokers. (C. Mauclair 1929 in Bernard 1929:20). (29) This assertion, however, is far from the truth. Charles Bernard refutes these statements already in 1929 in Les pompiers en délire by asserting that the majority of the Brussels galleries sold median-priced figurative art for which Mauclair fights. A few years later, during the crisis of the 1930's, it is also the modern art movements that shall be hardest hit. (30) DEVILLEZ V. (2003), p. 15. (31) HENNEMAN I (1992), p. 152. (36) Le Lampiste and La Vierge Consolatrice could form counterparts of each other as personages from two of Ensors most praised works. (37) On the certificate that was drawn up at the sale of purchase of the work in 1953 at Galerie G. Giroux states that La critique sur mon oeuvre is mentioned as the title. (38) These articles appear respectively in Plan (1/04/1934) and Le Rouge et le noir (18/04/1934).